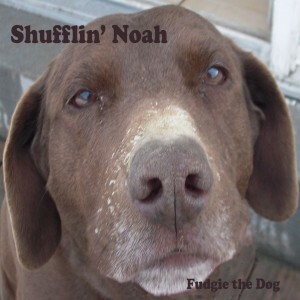 Live Musician Central is proud to announce the release of the new album “Fudgie The Dog” by the band Shufflin’ Noah. Live Musician Central author Matt Rushton is the lead guitarist and one of the principle singers and songwriters in Shufflin’ Noah. The “Fudgie The Dog” concept album was recorded live as it was improvised in Matt’s home studio. The entire album was recorded in one 2-hour session where the only planning consisted of 5 or 10 minute conversations between takes about what Fudgie would do next. The music, lyrics and melodies were all made up as they were being played and there are no overdubs or re-takes on this recording. You will hear some bad notes and the band is loose at times but things come together in a really pleasing way overall. For all you Fender fans out there, you know that Matt uses the Fender Cyber-Twin SE amplifier. That is the only guitar amp Matt used on the “Fudgie The Dog” album. Matt used a combination of his 1998 Fender Jeff Beck Signature Stratocaster and the Fender Cyber-Twin SE amplifier for every note on this recording. Click the link to see a track-by-track listing of every Cyber-Twin SE sound used on the album. You can check out clips of every track on the album by clicking the sound samples below. To download the album check out the “Fudgie The Dog” album download page.